There is excitement in every remodel. There’s energy. A seeing of possibilities and anticipation for every memory waiting to be made. Realizing the full potential of your space, and finally having the room you’ve always wanted. Carmel Builders shares your vision because your home is our passion. They were fantastic. I can't speak highly enough about their professionalism, answering questions, and all of those good things. I don't dislike anything. They did a fantastic job and they added a ton of living space.They listened to what we wanted in terms of what we envisioned for the project, fantastic. I would like to recognize Joe, this was his first project by himself and he did a fantastic job. They met and exceeded all of our expectations. We have worked on many projects with Carmel Builders and have always been extremely satisfied. We have in the past and continue to recommend them to our clients. Carmel Builders is dedicated to customer service and ensuring that the client is happy with their workmanship and provide all the necessary support that goal requires. I have used Carmel for two projects at my home--a mudroom and the conversion of a screened porch to a year round room. I could not be happier with the results of both projects. The commitment to ensuring a quality product and making the client happy are the areas that stand out and make for an exceptional experience. 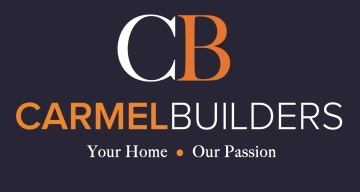 Carmel Builders Inc. Thank you, Elizabeth! We have enjoyed working with you on both of your projects and hope to have the opportunity again! Louis Weiher was simply amazing to work with! He was always up front, responsive to communications, and very professional. I’d work with him again in a heartbeat. I was most satisfied with the overall experience! It was excellent! I was most satisfied with the level of communication. They always kept us informed about what was going on and when things would be done. Even after the house was completed and they had to come back and adjust things, they were always very good about communicating. I would recommend them to anyone! They were very professional and they treat you like family! I was most satisfied with the overall completion of the job. Carmel Builders Inc. Thank you so much Barbara and Joe! Clients like you are such a big part of why we love what we do! We have now used Carmel Builders for 4 projects, both on the interior and exterior of our home. Trust, workmanship, and a fair value are the reasons we kept coming back to Carmel Builders. Carmel Builders Inc. Thank you for the wonderful review - we really appreciate it! I was very satisfied with my fireplace project. Everyone was polite, on time and kept the worksite as clean as pissible. Louis was great about coming and checking on the project almost daily.